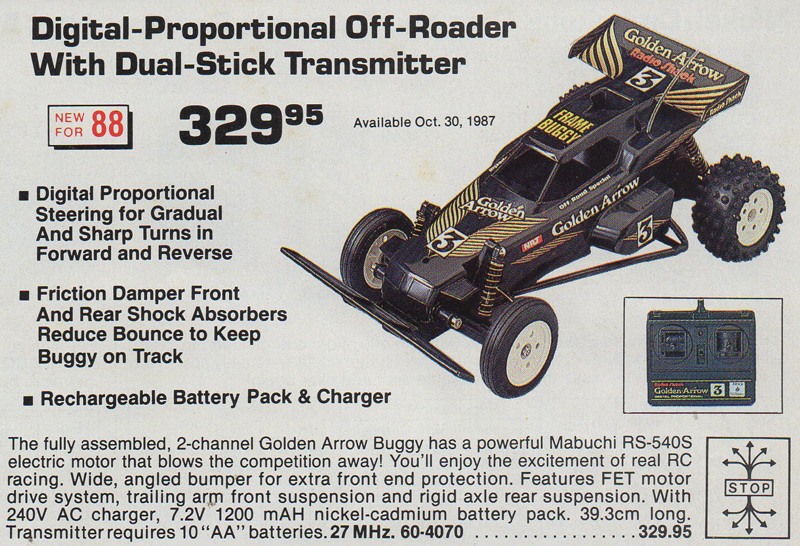 With the huge popularity of 1/10 scale off road buggies in the mid-1980s, it was only a matter of time before Tandy / Radio Shack stores released something to compete (at least for the hearts and minds of children) with the popularity of brands like Tamiya and others. 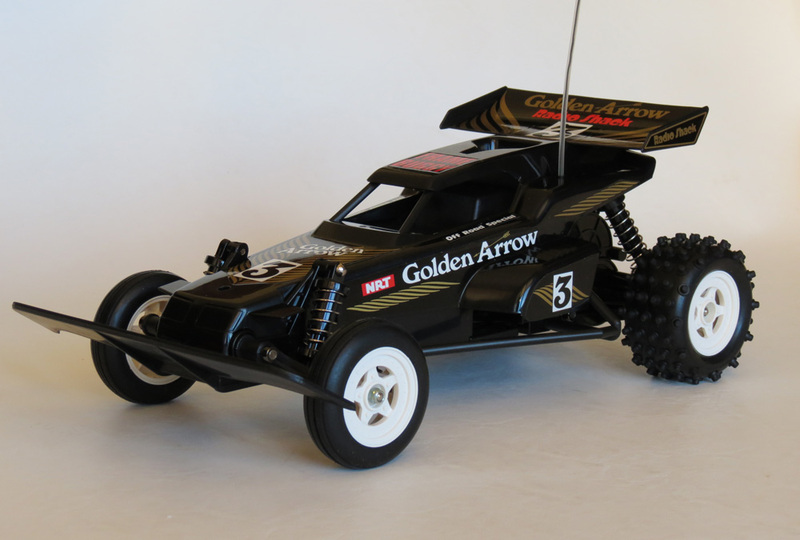 And so they released their finest R/C car to date – the Golden Arrow Buggy. 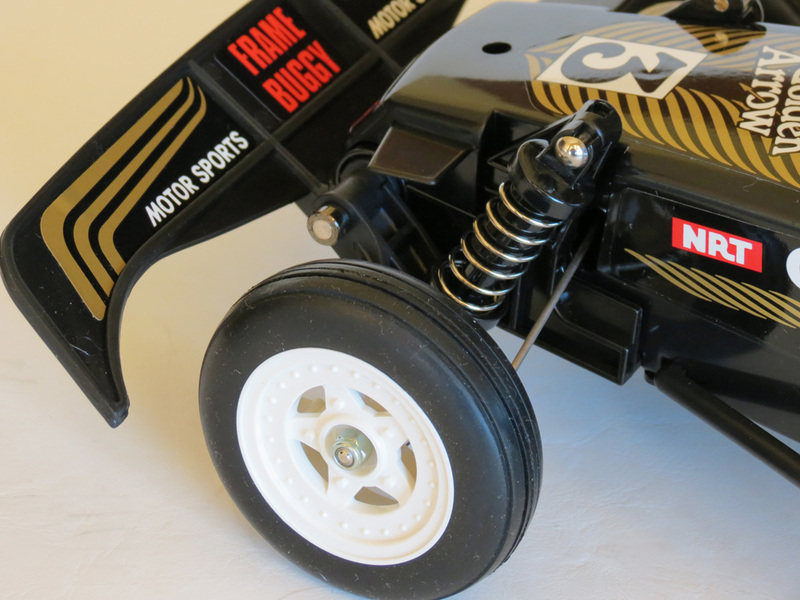 In 1987, 1/10 hobby-grade R/C buggies had already been around for many years, and it had become a huge category thanks to the popularity of buggies and trucks from Tamiya, Kyosho, Associated, Marui and many others. As the decade progressed, more and more companies attempted to take a slice of the 1/10 off-road market. And even toy-grade R/C companies like Nikko, which had been highly successful in selling smaller, cheaper, ready to run electric off-road buggies, were starting to think they could get involved in the more high-performance end of the market. At least, at the entry level. 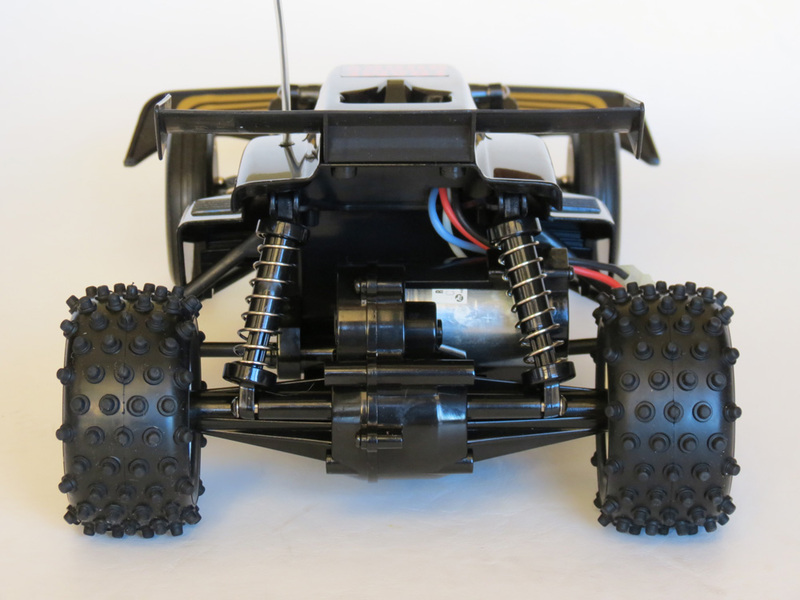 In 1986, Nikko developed and released a 2WD, 540 motor powered buggy called the Rhino (also marketed under several other names in different countries). 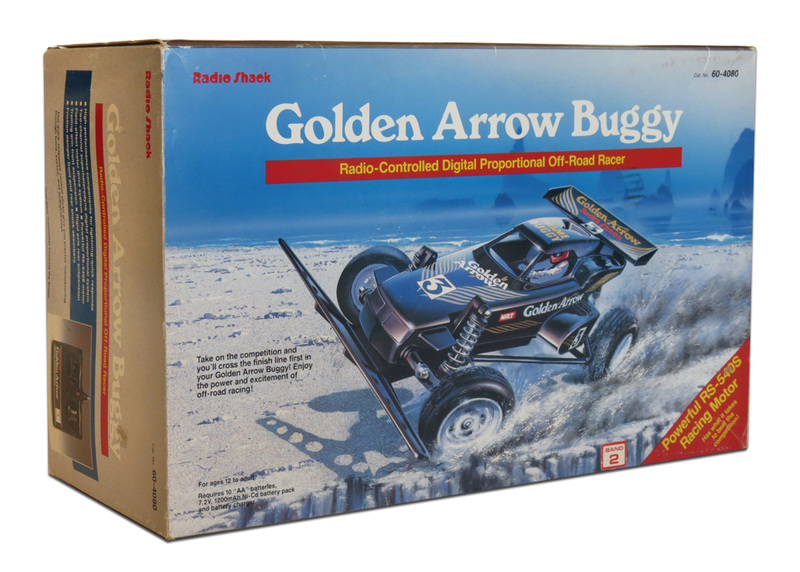 Later, this buggy platform was licensed and customized for Radio Shack (with a new body and name) as the Golden Arrow Buggy. I can pretty much remember the first time I saw a Golden Arrow in store. At 1/10 scale it seemed so much larger than the other R/C toys I had owned or driven at that time, and I can also remember being aware that the price was far beyond anything my parents could afford. I think I just walked past looking at it, without actually touching it. The buggy itself is basically a fairly typically configured (for the time) 2WD, utilizing independent front suspension, rigid-axle rear suspension, a 540 Mabuchi Motor, some large balloon spike tyres at the rear and some straight ribbed ones at the front. And all powered by the ubiquitous 7.2volt battery pack. The Tamiya Grasshopper and Hornet buggies had of course been such a massive success from 1983/1984 onwards, that their designs became the default setup for most basic 1/10 scale buggies of the era – it’s a simple, reliable, strong, and relatively fast design that has been copied a hundred times and even still lives on to this very day (in the form of many toy electric buggies and even a few of Tamiya’s current kits). You might notice that the Tandy catalogues for the Golden Arrow often made mention of a feature called a “F.E.T. Motor Drive System”. I always wondered what this “F.E.T.” thing was as a kid. FET actually stands for “Field Effect Transistor”, and it refers to a technology designed to aid electrical conductivity that actually dates right back to 1926. My circuit board knowledge is a bit rusty, but you can geek out over it here and here if you’d like to learn more. I believe it was part of the car’s on-board electronic speed control circuitry, which, given that most hobby grade kit based cars of the time still came with mechanical speed controls, was actually a technical advantage. Not only that, but it enabled kids to boast about their F.E.T. Motor Drive Systems in the school playground, and when you’re 10 years old that’s pretty important. And it certainly rolled off the tongue a lot easier than Tamiya’s “F.F.P.D.S.” (a long-winded suspension acronym developed for the Tamiya Super Champ). So how well did the Golden Arrow actually perform? And for any kid whose family was lucky enough to afford one, they’re sure to have plenty of happy memories of blasting this buggy around backyards, parks and dirt tracks. With it’s hard plastic body, friction shocks (no oil dampers), and dedicated Nikko-designed Digital Proportional radio system, it was a little heavy. Overall performance was a bit short of the buggies from Tamiya that it desperately wanted to match, although it had no problem blowing away any Tamiya with the smaller 380 motor of course (not to mention Jet Hoppers). The Nikko radio gear used was their standard Digital Proportional handset of the day (mated to an open circuit board inside the car – not something designed to be tinkered with), which had worked admirably on many of their previous cars. However none of Nikko’s previous Digital Proportional cars were quite as fast as this one – which meant the radio responsiveness actually felt a bit slow for the car. Driving a Golden Arrow at high speed therefore required you to be a bit mindful that it would respond to your commands a tiny fraction of a second slower than you might otherwise expect (if you’re used to fast buggies with hobby grade radios). Not so funny after all. Clearly, in the right hands, a Golden Arrow was in with a shot. Looking at the car from a design standpoint, credit has to be given to Radio Shack and Nikko for coming up with a very tidy shape. While I often talk about the toys of the 1980s as if everything was peaches and cream, the reality is that there were so many R/C toys made during that era that more than a few of them were either poorly designed or downright ugly to look at. Not so here – this is an aerodynamic, sleek off roader that still carries a nice scale realism (despite the lack of a driver figure). There’s even a hint of Formula 1 thinking in there beyond the John Player Special style black/gold – note the little wing-tips either side of the nose and between the front wheels, which were occasionally seen on 1970s F1 cars. 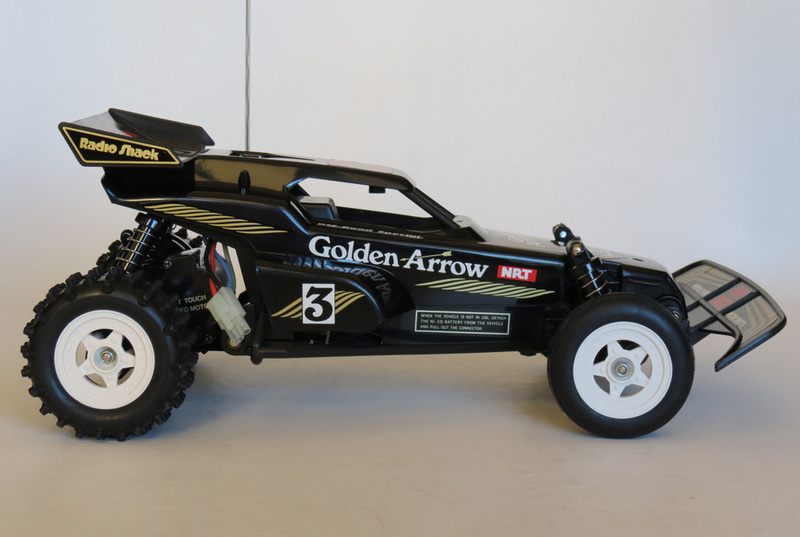 By early 1991, the Golden Arrow had been discontinued, although some of the successive buggies at Tandy seemed to use the same chassis with different body designs. There was also the Red Arrow (1988-1992), a similar buggy and something of a little brother to the Golden Arrow, that I will cover in a future article. Thanks to it’s popularity back in the day, the Golden Arrow now has reasonable collectibility, as there are a fair few people with fond memories of this classic buggy. As with all ready-to-run cars, the fact it never needed assembly meant that most of the examples manufactured were run immediately, leaving very, very few brand new ones left in the world. Used examples appear on eBay almost all the time of course, and depending on how worn out they are, they usually fetch between $50 and $200. How much could you expect to pay for a brand new one? Well if you can ever find one, it’s got to be worth at least US$500 in my opinion. My example came from an ex Radio Shack employee who had kept it in storage for about 25 years. But this is definitely a car I’ll never sell. Also be sure to check out the Radio Shack website here as they’ve actually got the car’s original owner’s manual and exploded view diagram online. Do you know where I could buy tires for the 1987 golden arrow race car? Mine are worn down. Hi Danielle. The good news is, you can find Golden Arrow tyres on ebay sometimes. I bought some on there a few years ago. There may not be any available right now. And it may be months before some more appear. So set up some saved searches on eBay so that you get notified when they come up, rather than manually searching all the time. You should also try searching for “Nikko Rhino tyre” as I think those had the same tyres. And be sure to also search for both “tyre” and “tire”. Hello. I was given one of these Golden Arrows after finding it in a garage I helped clean out. The car is in decent shape. I put new AA’s in it and the controller. The controller powers on, indicated by the red light. I bought a new 7.2v battery and charger for the car and put it in after a full charge. I turned the car on, but no response from the controller. I know very little about r/c cars, just thought it would be a neat free toy to work on. Might I need to replace anything else on the car? Thanks! Hi Ross. Make sure the contact points for the AA batteries in the car are clean, as it relies on those small batteries (not the 7.2v) to pickup the actual radio signal. And likewise make sure the 7.2v connector is clean. Failing that, I would open the car up and look for wires that may have become detached (and re-solder them if they have). Failing that, well… there are times when the circuits just die (e.g. if the car has been in deep water), and require an electronics expert to test and work out which element has failed. In that instance, your options are to either buy a second (working) Golden Arrow ($50-$100) and transplant all the good bits into one car. Or go the harder route of modifying the car to install standard radio gear. Love reading your posts about the old Tandy Cars. I had the Red Arrow which came right around this time or just after and that ting was fast. Similar set up with the 540 motor and the 4 AA batteries in the car to receive the radio signal / 7.2 V pack for the drive. Hello. I have been involved with Radio Control Cars and Trucks since 1979. I have owned a Remco Trans Am, a Radio Shack Jeep Renegade, and a bunch of Tamiya Kits like the Grasshopper, Hornet and the Fox. I remember back in 1987 when the Golden Arrow debuted. I wanted one so bad. 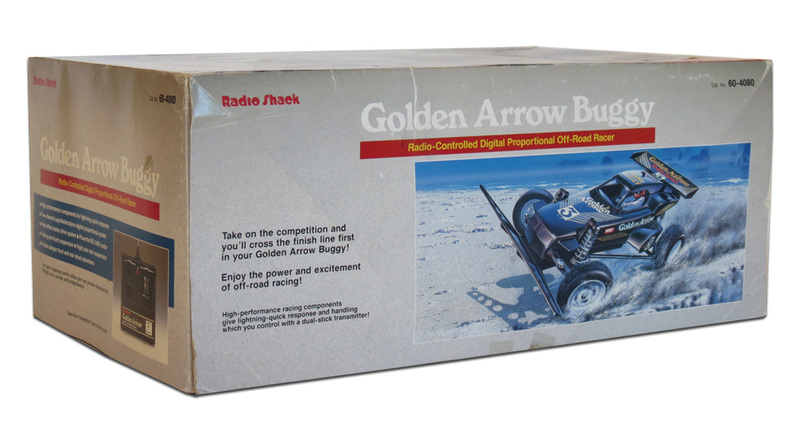 It would be great if Radio Shack would re-release this buggy with modern upgrades. I would be the first in line to purchase it! Great website. Brings back good memories of my childhood. Cheers Rob, much appreciated! The Golden Arrow really was a great looking model. Not sure what the chances are of it being re-released. Wow, Remco… now that’s an R/C toy brand you don’t see too often. Sounds like you’ve been enjoying R/C even longer than I have. My dad gave me his and it has a broken wheel assembly. Do you know where I can get a new wheel? 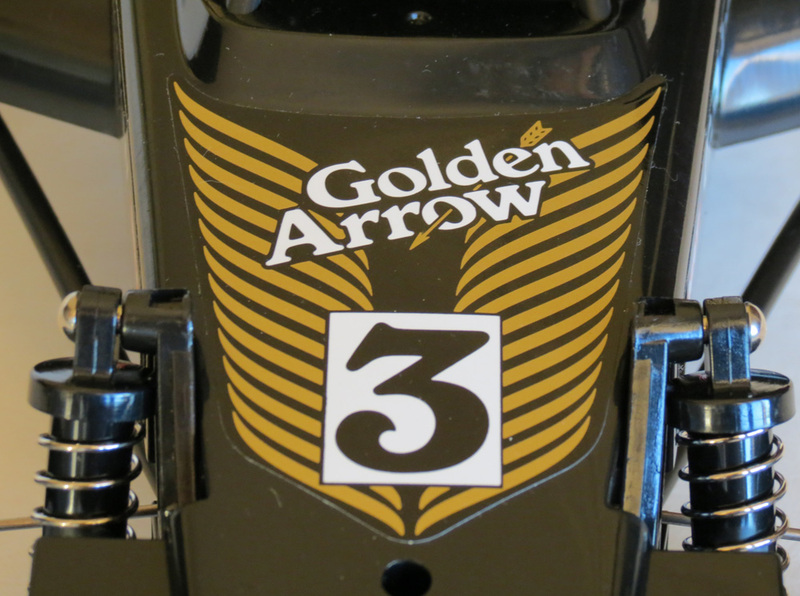 I have a Golden Arrow sitting in a box in my closet. It sat in my in-law’s garage for years before he gave it to me a few months ago. I was hoping I could buy a new battery and watch it go, but it doesn’t for whatever reason. All wires seem to be intact. Anyone interested in it? I might be interested for the right price so that I can repair the one that my dad gave me. I am trying to repair it for my daughter that I am adopting this month. My grandson’s found the Golden Arrow RC Car of my Son’s , really need to find large yellow battery # , or if anyone can plz lead to me get the big chargeable battery, I wish come true for an ill Grandmother , Thank You all so much ! Hi Joann. Apologies for the delay. 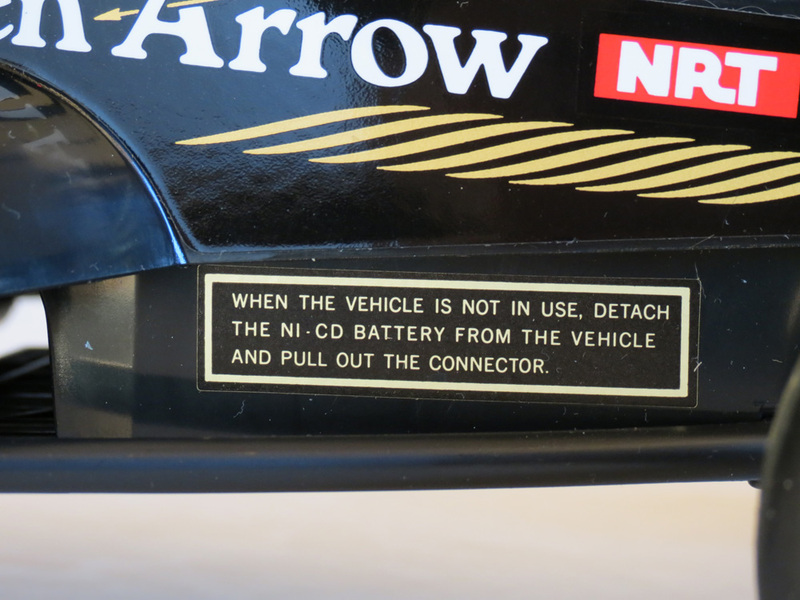 You can run the Golden Arrow with any 7.2volt battery pack. Just search for “7.2volt battery pack” on google or ask for one at any hobby store. also needs charging init , right ? Yes you will need a charger for it too. OH, forgot ! Thank you so very much , sent way too soon , ! I had both the golden arrow and its cheaper cousin the red arrow and both provided me with hours of fun. Wish you find something of that quality for a reasonable price now a days. I also had a super lobo gas powered r/c that was beast. Thanks for the comment. Actually the Tandy Turbo Fox was an entirely different car 🙂 – smaller, and ran on 8xAA batteries. 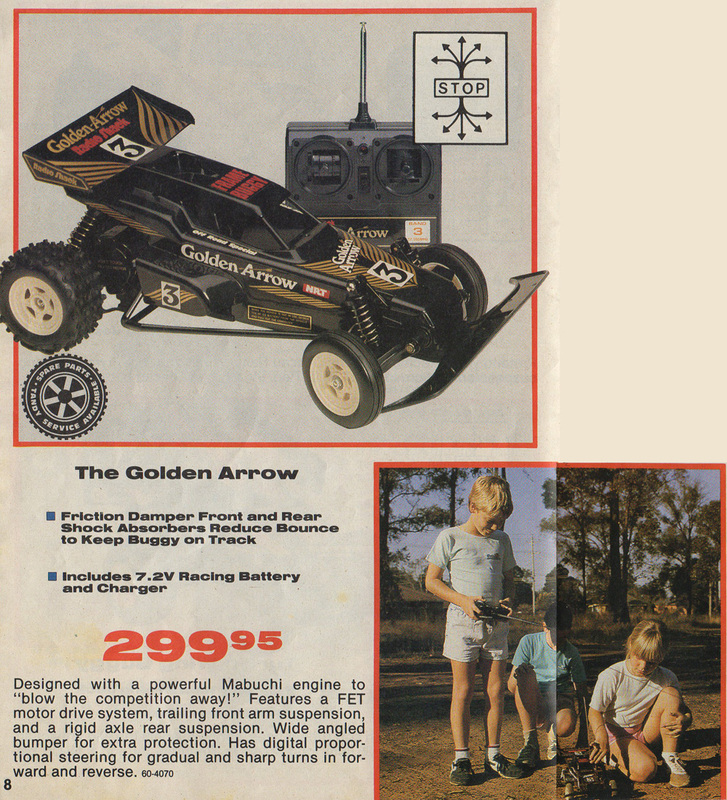 There were a couple of other buggies sold at Tandy that shared the same platform as the Golden Arrow, but had different bodies and different names – namely the Thunder Fox (this might be what you were referring to?) and also the Sagitta Fighting Spirit. 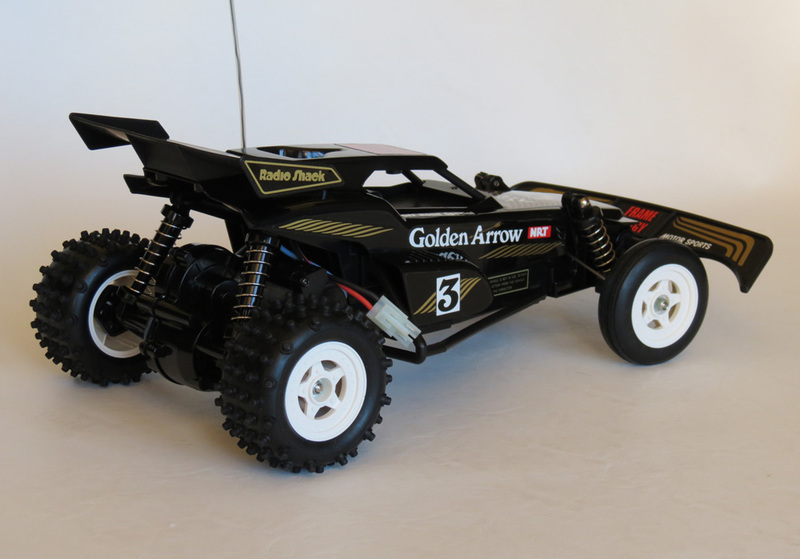 I still have my Golden Arrow from 1988,and it is one of my most cherished RC buggys.I Love The 80s,and all The Awesome RC cars that were put out back Then. 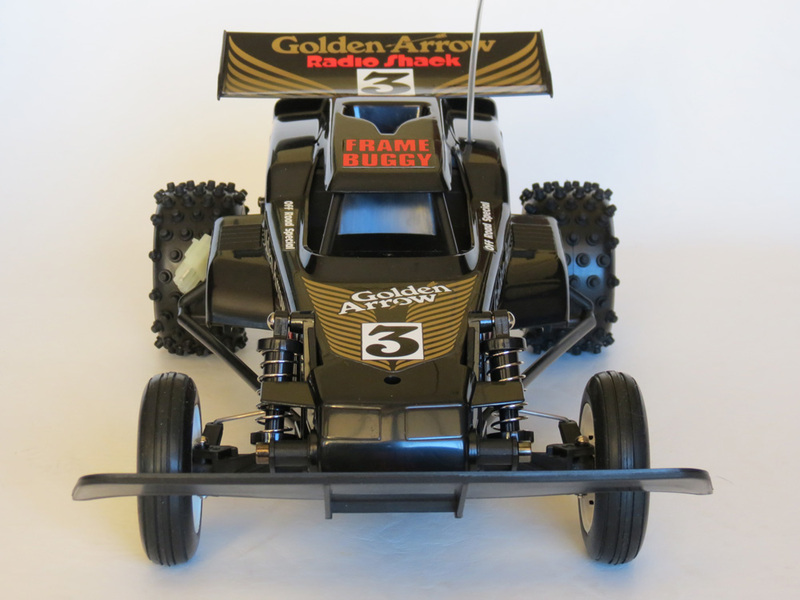 I purchased the Radio Shack Golden Arrow Buggy in1987 for my son. It been sitting in the closet for 25 years. I am trying to get it running for my Grandson. Every thing works, but there is a broken part for the steering, its part number HC4887 (Upright set). Does any one know where I can purchase parts for is car? Thomas – parts for the Golden Arrow were scarcely available back when it was sold, but a few have still lingered over the years on online auction sites. I don’t have any spares for sale at the moment, so would suggest you keep checking there, as that’s where I would get them from. I have my sons red arrow that he had in the 1980s and want to get it running again. I’m in need of a remote control and charger, does anyone know where I can buy these from? I live in the UK. Hi Pam. My advice is to search ebay, and save the search so that you are notified of new results. You could be waiting a while for an original Red Arrow transmitter to come up, but they do occasionally. Chargers can be bought from any hobby store today, as they were in the 80s. Hi and thank you so much fir replying to my post. I will take your advice and hopefully have the buggy running by summer. I’ve seen a transmitter advertised and it has 2e and what looks like 005MHz. It is being sold with a radio shack red arrow in rather worse condition for wear but all I want is he transmitter had aerial. Do you know if that would be compatible for mine as it has 2e 145MHz stamped on the undercarriage. Any advice would be gratefully received as I know very little about the car only how to work it! Hi Pam – there’s a chance the transmitter for the Red Arrow will work OK if the frequency is identical to your Golden Arrow. But here’s some technical info because unfortunately it’s not that simple 🙂 So brace yourself… The Golden Arrow was 27MHz. But within this frequency, each model sold operated on one of several “bands” – so the exact frequency of your car might be 27.145Mhz, or 27.095Mhz or something else like that. You will need a transmitter with this exact frequency. A Red Arrow transmitter with this exact frequency may suffice. 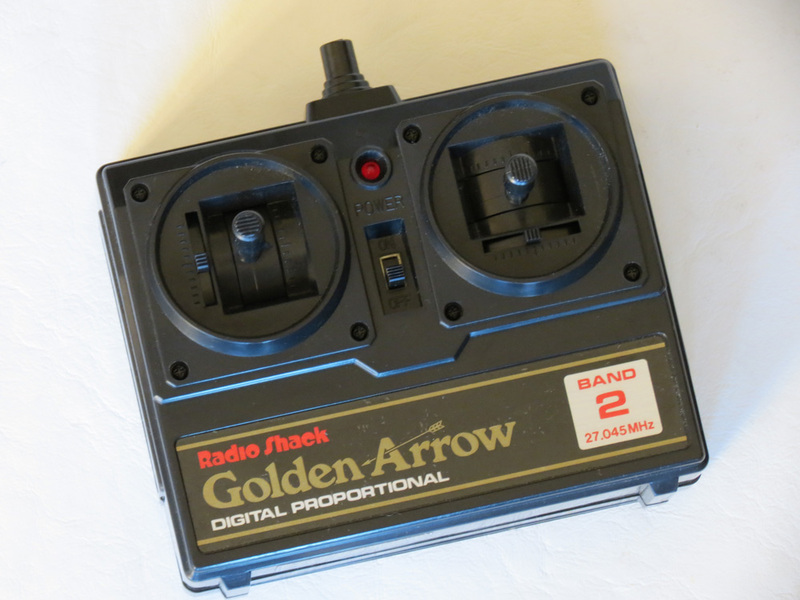 But as the Red Arrow was made by an entirely different manufacturer to the Golden Arrow, ideally, an original Golden Arrow transmitter on your exact frequency is the guaranteed solution. If your car doesn’t have a sticker underneath it identifying the “band” or the exact frequency, then it can be determined by opening it up and looking for the crystal on the circuit board. The crystal is a silver metal rectangular thing soldered onto the circuit board. The frequency number is always printed on the side of them. Once you have this number, you can either take the plunge with a non-Golden Arrow transmitter that appears to have the same exact frequency. Or it’s a waiting game to wait for a Golden Arrow one to come up on eBay – and for this I would suggest setting up saved searches so you are notified any time one is listed. My apologies Pam, I thought you had the Golden Arrow (I probably got distracted by the article title rather than your question!). Good luck with it, it sounds like you have the right idea now – just need to find a Red Arrow one with the right frequency number. Vintage R/C is a game of patience, but pretty much everything will come up for sale eventually. It’s ok I guessed that’s what happened lol. Thanks for your help and I’ll keep you informed of progress. Hello when I was younger I got a golden arrow from a kid couldn’t buy one soon enough ..lolo mom payed 250$ I am sure had extra stuff..about 18 years ago help friend move soon car got excited..long short he gave me car. I did not get remote been looken.. I have a golden arrow cat.no.60-4070 under wing band 6 blue white sticker and 240 under it. Please please any info on how I can get remote or other would be great.been dien to try.by boy is 11 and love to see him try it.he seen but we don’t play with in hope a remote comes up.love site and info lot of memory’s.thank u. Lots of child hood memories.awsome.looking for a remote.any for golden arrow ..band 6 240. Info help anything be awsome.thank u.
I bought a golden arrow with paper route money. I remember going into the mall and paying in 1s, 5s and 10s. The guy said he wouldn’t need to go get change that day. I played with that thing a ton. I got it during winter and still drove it outside. It got wet, stopped working, dried out and was ok again. It lasted quite a while considering the abuse it took. When the Red Arrow came out I talked to the Radio Shack guy about it and he said the Red Arrow had a slightly higher top speed. It was a two speed and in high it was faster but with less torque. I wasn’t happy about that after I’d saved up for and bought the fastest RC car on earth as far as I knew. Great comment Joe, thanks for sharing. It actually had one speed just like the Golden Arrow. It was priced cheaper because it contained some simpler components and was manufactured by a totally different company to the Golden Arrow, which was not based in Japan (unlike the Golden Arrow which was made by Nikko in Japan, during their peak years). As for which one was faster, well that’s something I will definitely be testing for myself eventually. They were certainly very close in speed both being 540 motor powered and similar in weight and design, so the deciding factor will have been gearbox and general drivetrain/bearing smoothness. That said, my feeling is that the Golden Arrow was the better quality car overall and priced higher accordingly. Both are now among the great classics of 1980s RC, and I’ll be writing about the Red Arrow in an upcoming article. Hi when I was a young lad I worked for a summer to scrap up cash for golden arrow..well radio shack had none both me and mom went to..bought this wild horse or something monster truck.junk.saved agan and a guy next door had one.loved it abused it.best memory..well came across car need a remote.any idea anyone.. I pay wont my to boys to experience it to.lolo the memories I would get from watching them play priceless.please help..
First I’d like to say I really dig what you do here and thank you for all the reviews and helpful info that you take the time to post and discuss with us. 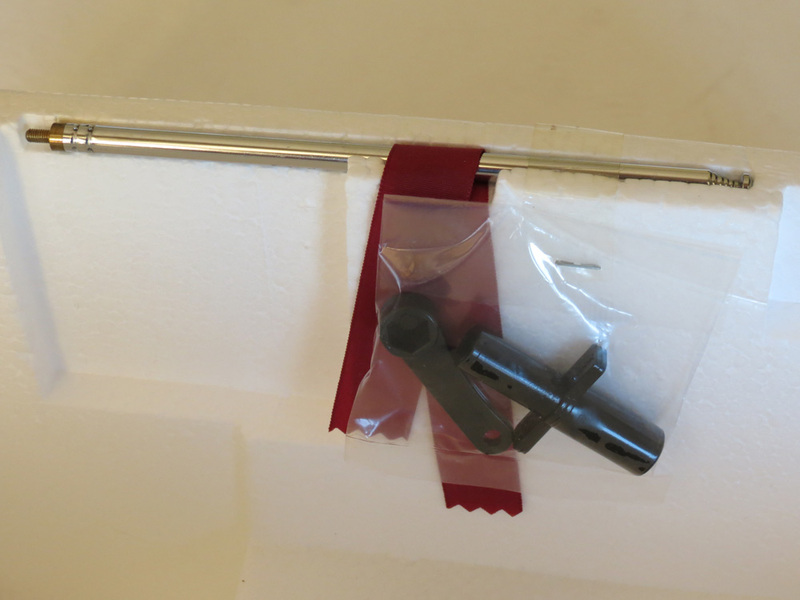 I remembered having the Golden Arrow or a similar one which inspired me to go to storage and see if I could find it….which I did. I was wrong about the particular model though. It was the Radio Shack Black Phantom which was given to me as a Christmas Gift in. 1991. It’s in fair shape but regardless Im looking forward to doing a complete restoration on it. 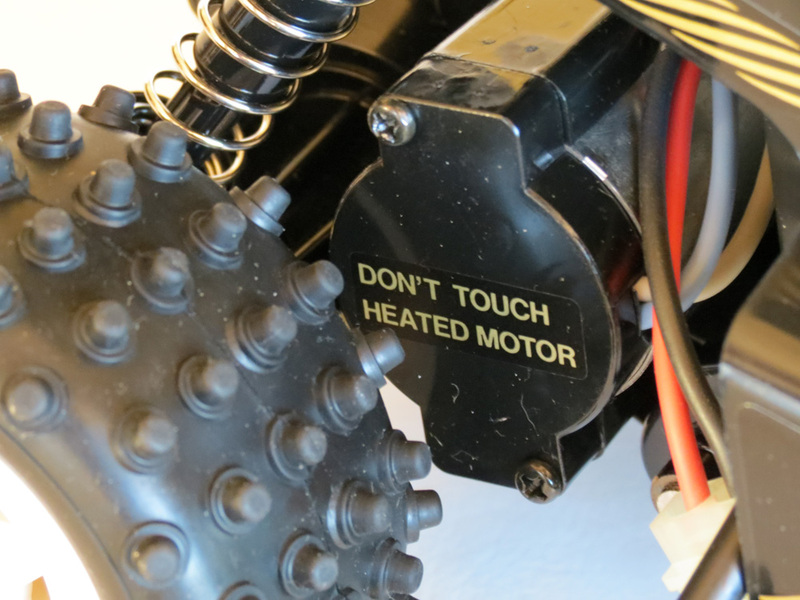 I was wondering if you had any experience with this particular RC dune buggy and if so what did you think about it. It always reminded me of the Golden Arrow. Maybe because they had a very similar color scheme going on with the black and gold. Sorry if I posted this in the wrong section but I didn’t see any reviews for it.